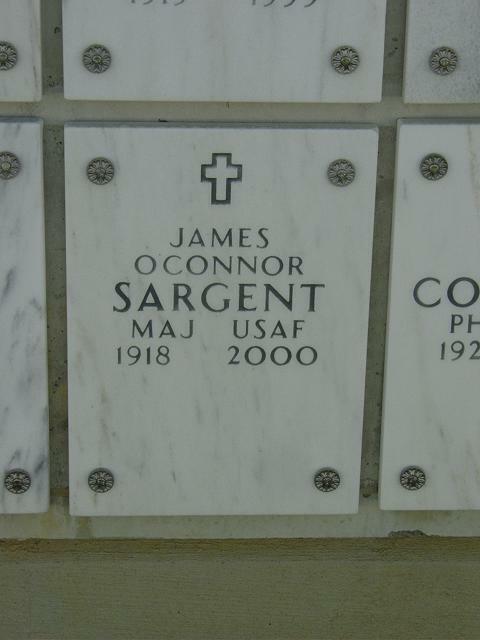 James O'Connor Sargent, 82, of Pensacola, Florida, died in George Washington University Hospital December 8, 2000. He lived in Washington and Arlington for 23 years. A writer of mysteries, novellas and short stories, he helped found a Writers Club in D.C. that has met monthly since 1953. Born in Buffalo, New York, he attended Fordham University and the British Intelligence School in Calcutta, Indiana. In the US Army Air Corps in Burma and China he was a Combat Intelligence Officer. Later he headed the US Historical Office in Seoul, Korea, leaving the Air Force in 1947 as a Major. He was awarded the Bronze Star for bravery and the Chinese Freedom medal among others. He is listed in Who's Who in America, Who's Who in the World and in Who Was Who in the 14th Air Force. Survived by his wife of 51 years, Mildred E. (Clark) Sargent; sister-in-law, Susan Bowling Sargent of Memphis, TN; nieces, Mary Lou Sargent Berberich of California, Margaret Sargent Marren, Dorothy Sargent Dolan, Joan Sargent Shriver, Patricia Sargent McLellan of New York, Nancy Bridgman McConnell of Kentucky and Kathleen Bridgman Bowen of New York; nephews, Kevin Sargent of Tennessee, Emmett and Colin M. Sargent of New York; many great nieces, great nephews and great-great nieces and nephews. He was preceded in death by his parents, Joseph Hughes Sargent and Mary Ann O'Connor Sargent; brothers, Daniel, Grattan, Emmett and Charles Sargent; sister, Catherine Sargent Bridgman; nieces, Elizabeth Sargent Cunningham and Kathryn Sargent Martin; and nephews, Patrick and Charles J. Sargent II. A Funeral Mass and interment with full military honors will be held at Arlington National Cemetery on May 21, 2001, at 10:45 a.m. In lieu of flowers, please contribute to your favorite charity.